I first saw this slice on Jane’s, (The Shady Baker) July 2015 In My Kitchen post. I was immediately smitten by the idea of it. In my view there is no better combination than chocolate, walnuts and rolled oats. It is a combination made in heaven. I commented that her slice looked and sounded wonderful and Jane generously emailed me the recipe. I can assure you the slice did not disappoint. It is to die for. I mentioned to Maus last night that I don’t think I should make it again as it is so good, I can’t get it out of my mind and, subsequently, I am eating much more of it than my waistline would suggest is wise. The base is firm and crunchy, the filling is soft and gooey and the icing is sweet and chocolaty: very good indeed. I searched Jane’s blog for the recipe so I could link this post back to it but it appears Jane hasn’t posted it. As it is so yummy I decided the recipe must be shared. Jane mentioned that the recipe is from the 2015 Red Tractor Designs calendar. Line a slice/brownie tin with baking paper. My tin is 27.5cm x 17.5cm x 3.2cm and it was perfect so choose a tin about that size. Melt the butter and then add it to the dry ingredients. Mix well. Press the dough into the prepared tin. Put the butter and chocolate into a mixing bowl and melt. I did this in my microwave but Jane suggested placing the bowl over hot water – either way would do. Add the sugar and beaten egg, mix well. Add the sifted flours, milk and vanilla, mix well. Spoon filling over hot base and bake for a further 20 minutes. Remove from oven. Cool before icing. Add sifted icing sugar, vanilla and hot water. Spread icing evenly over slice. Top with extra walnuts, if desired. That icing/ganache looks so rich and delish. I’m always keen on anything with walnuts. Just polished off another one of your pumpkin cake loaves today. I love that recipe – so easy! Have a wonderful week Glenda. Mandy, Did you give soap making a try? Oh! No! Moya!!! What can I say? Hi Leah, it is a deadly good combo. Hi Ella, if it doesn’t, there will be all the more for you and that can’t be bad. Oh these look soooo good! 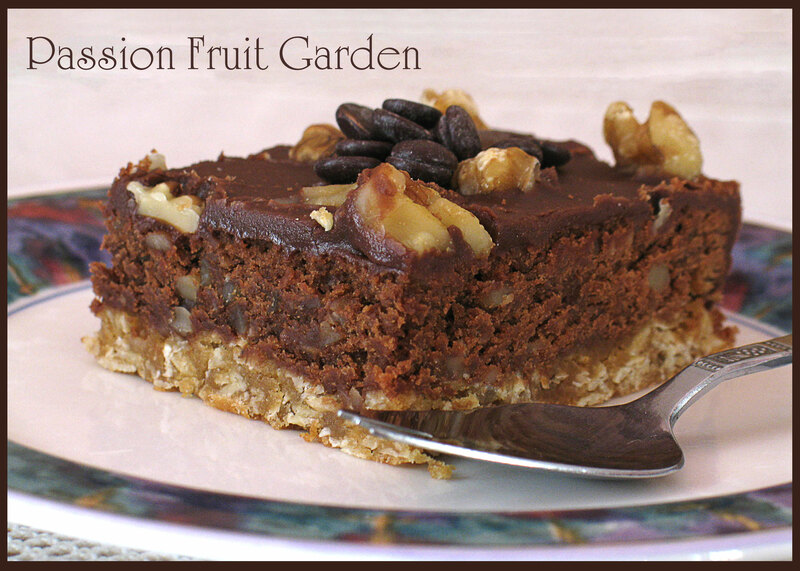 Love the combo of walnuts and chocolate with the crunch oats base! Hi Indira, we are of like minds. Hi Liz The bloody waistline always gets in the way doesn’t it? Just what I need. Scored a big bag of walnuts the other day. Looks perfect. Hi Francesca, it really is a great recipe. I followed it exactly and it turned out perfect. 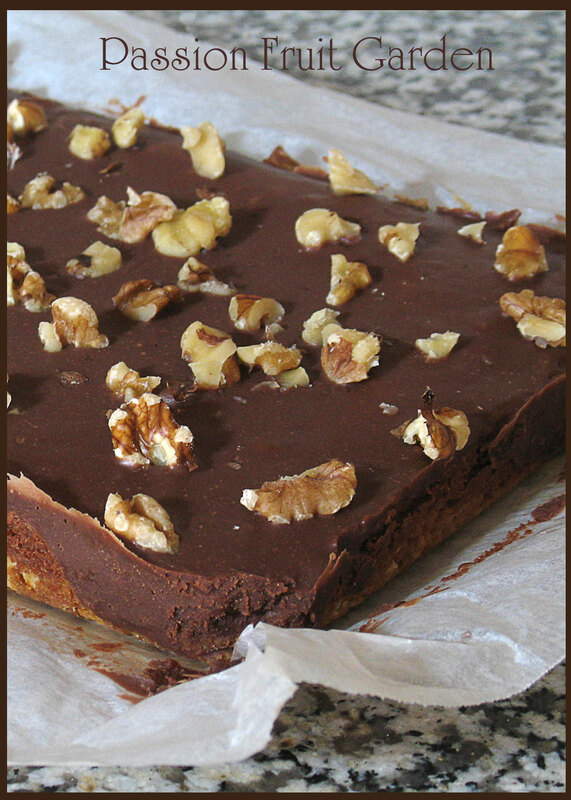 That’s great news Glenda and now, I am about to do your/Shady’s walnut slice. You hooked me with that first photo. Thanks for posting the recipe because it sounds like a winner. I saw this and thought it looked mighty good but lacked your tenacity in locating the recipe! This looks perfect for the weather we have at the moment. Anne, it is a great recipe. Jane sold me with her wonderful photo and description of it. She was not wrong.